Must be 48” or taller to ride. Take flight this Summer as you experience the thrill of skydiving, hang-gliding and bungee jumping all rolled into one! It’s a huge, bright yellow monument to mental mayhem looping into the sky. Hundreds of thousands of feet of wooden boards zig–zag high above Timberwood Amphitheater to create the park’s marquee ride. All aboard one of the family-favorite attractions at Magic Springs! Load a raft with your best buds and hit the river – that is if you don’t mind a tidal wave! You’ll see things from a new perspective – that is, if you can keep your eyes open! Take flight this Summer at Magic Springs as you experience the thrill of skydiving, hang-gliding and bungee jumping all rolled into one! We call it, SKY SHARK. First you’ll be hoisted to the top of a 115-foot steel arch before plummeting in a free fall back to earth at speeds up to 50mph. Bundle into the harness with a friend or two and wave bye-bye. You’ll stare straight down as you are hoisted up by a slim cable, until you’re so high you’ll hang in total silence 10 stories in the air with a birds-eye view of the entire park. There’s no turning back—the only way to get down is pull the cord. You're then instantly released in a state of total free fall. Just when you think you're going to hit the ground, a steel cable catches your fall swinging you forward. You'll then soar into the atmosphere across Magic Springs Lake creating a once-in-a-lifetime experience. Additional fee required. Cost is $20.00 for single, $30.00 for double and $40.00 for triple. X-treme. X-citing. X-traordinary. 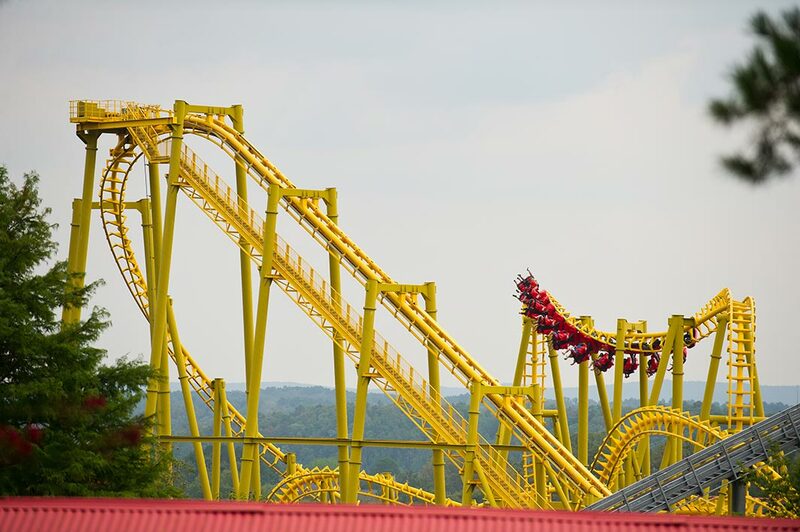 It stands as the Granddaddy of them all at Magic Springs beckoning across the Ouachita Mountains into the hearts of adrenaline junkies coming from miles around to experience the first coaster of its kind in the United States. 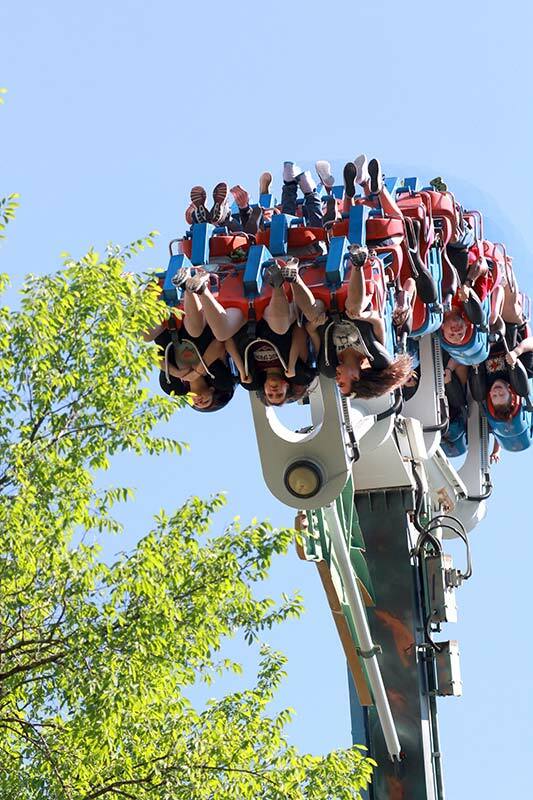 X-Coaster makes it possible to experience inversion without the constraint of a shoulder harness. The trip starts with a vertical ascent hitting its peak at 150-feet up in the air. 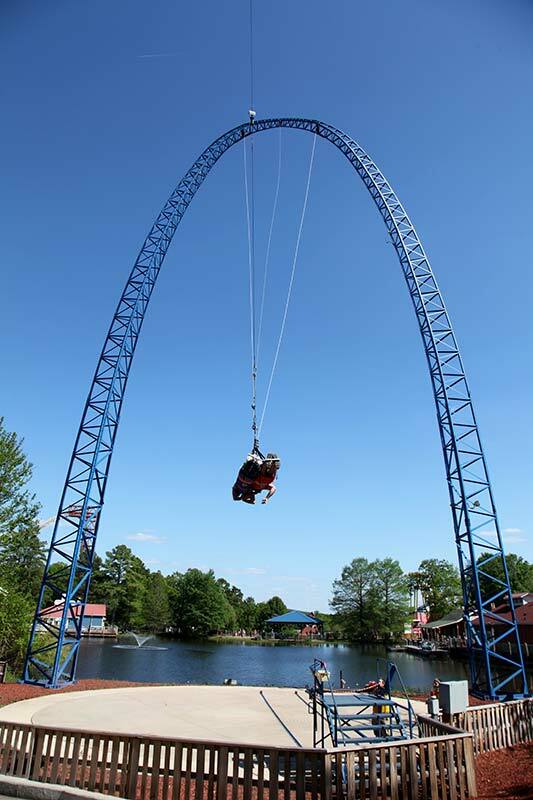 The most talked about highlight of this ride is the thrillingly slow quarter-loop backwards that leaves riders dangling high above the park for a heart-pounding moment before they are sent on a 360-degree corkscrew roll, followed by a plummeting drop at more than 65 mph. You’ll rocket past the station and other guests in line to hit the high peak again, then fall backward through the station and back up the other side of the ride with the back of the train once again taking a partial twist around a portion of the loop on top. The train tumbles back toward the earth, the final fall of the ride, then, comes to a stop near its peak before slowly taking you backwards into the station. Your bravery will never be called into question again! 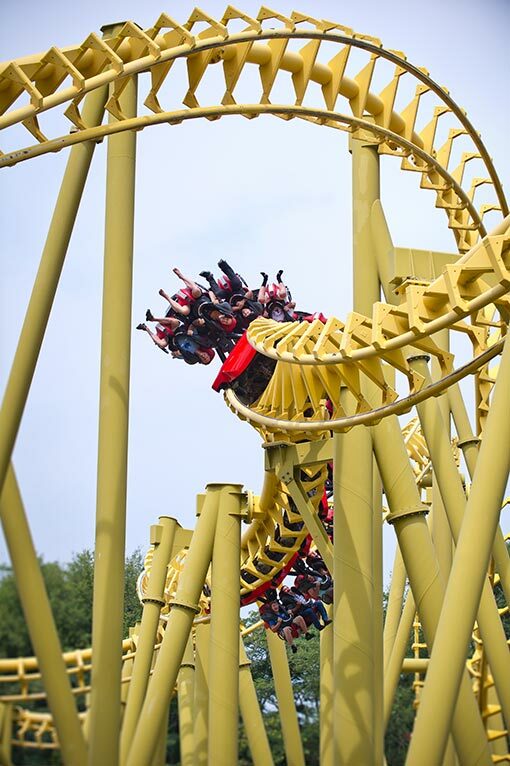 X-Coaster opened at Magic Springs in 2006 after being manufactured in Germany, which is home to the only other X-Coaster in the world. This attraction is available to riders at a height of at least 52”. The challenge is issued the moment you gaze up to Gauntlet as you make your way toward the park’s entrance. It’s a huge, bright yellow monument to mental mayhem looping into the sky. Will you or won’t you? It takes nerves of steel to endure this 110-foot drop into a whirling dervish of five inverted loops and mind-blowing bends. You’ll feel strong side-to-side, up-and-down, and front-to-back forces traveling 2,200 feet of steel coaster insanity all while suspended under the coaster’s tracks at speeds up to 50 mph. 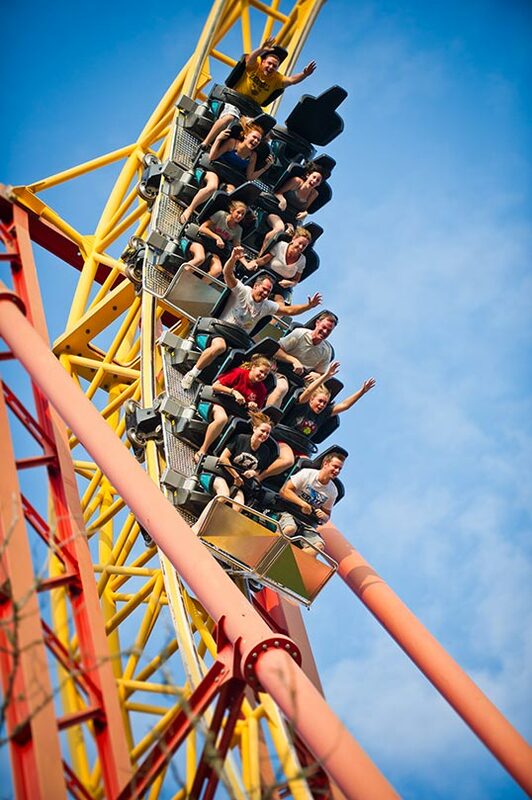 Feet dangling, adrenaline pumping, hearts thumping…this is the very definition of a thrill ride. We’re celebrating Gauntlet’s 14th year anniversary at Magic Springs during the 2017 season. The name, “Gauntlet,” was chosen by Becky Branch of Jacksonville who participated in a widespread radio event to name the new attraction at the end of 2003. 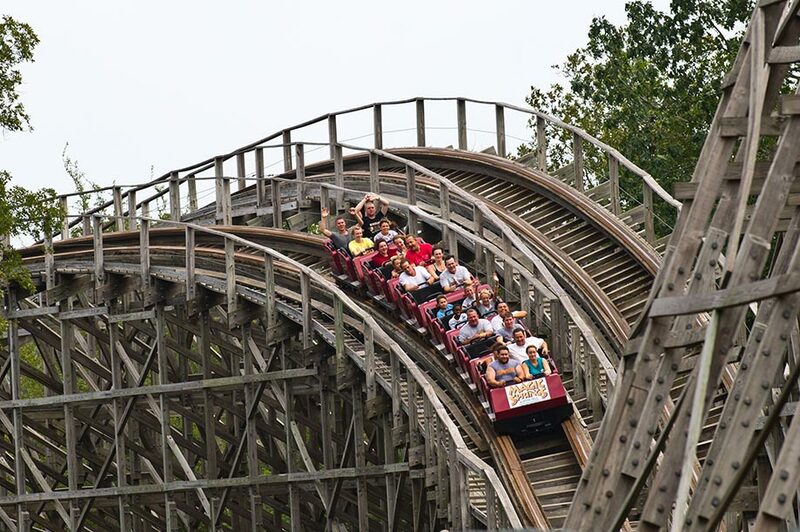 Hundreds of thousands of feet of wooden boards zig –zag high above Timberwood Amphitheater to create the park’s marquee ride – Arkansas Twister. 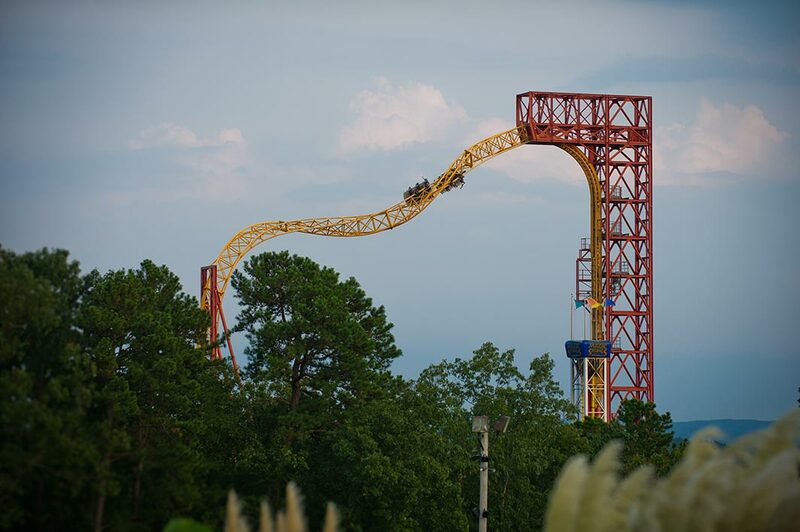 This classic out-and-back coaster heads out of the station to transport riders to the top of its lift hill after which it releases to a 92-foot drop propelling you through an up-and-down journey across 3,500 feet of track at top speeds of 50 mph. You’ll experience the sensation of weightlessness, alternating with periods of downward force nearly three times the force of gravity! This ride was one of William L “Bill” Cobb’s many masterpieces in roller coaster engineering. Its original home was in Florida where it operated under the names Roaring Tiger and Florida Hurricane. It was a favorite ride of pop star Michael Jackson when he was on a shoot for a few weeks in that area. Magic Springs purchased the ride in 1991 and it was transported to the park, from Florida, in 40 semi-trailers. It opened in 1992 with the first ride on May 30. Since that time, multiple generations of Arkansans have shrieked and screamed up and down its track. 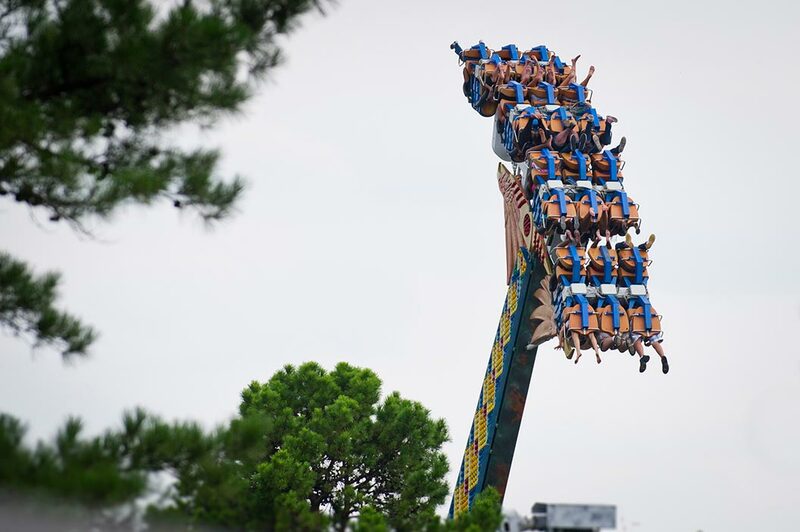 It is a high-thrill experience available to riders at height of at least 48”. All aboard one of the family-favorite attractions at Magic Springs! 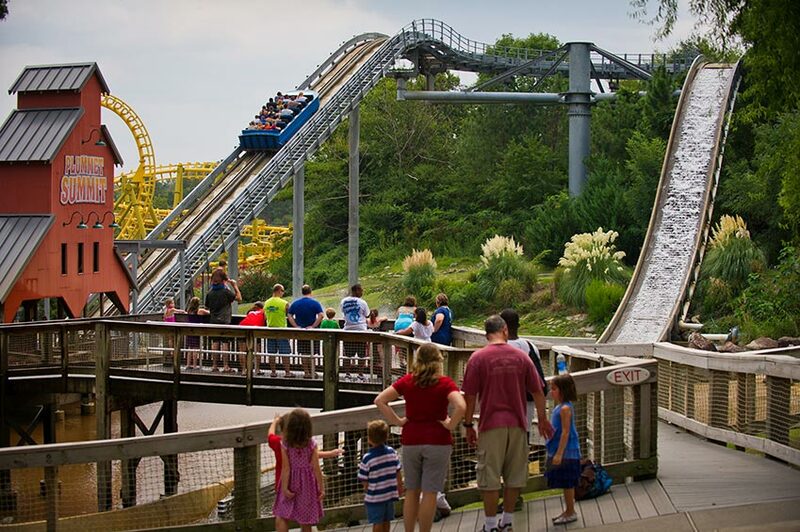 Three lift hills propel your journey on this runaway mine train adventure across 3,500 feet of track twisting and turning through some of the park’s most beautiful scenery. At three minutes in duration, this coaster is our longest trip, reaching heights of 50 feet and a speed of 30 mph in a screeching tunnel finale plunging you into darkness before returning back to the station to collect the next group of anxious thrill-seekers. 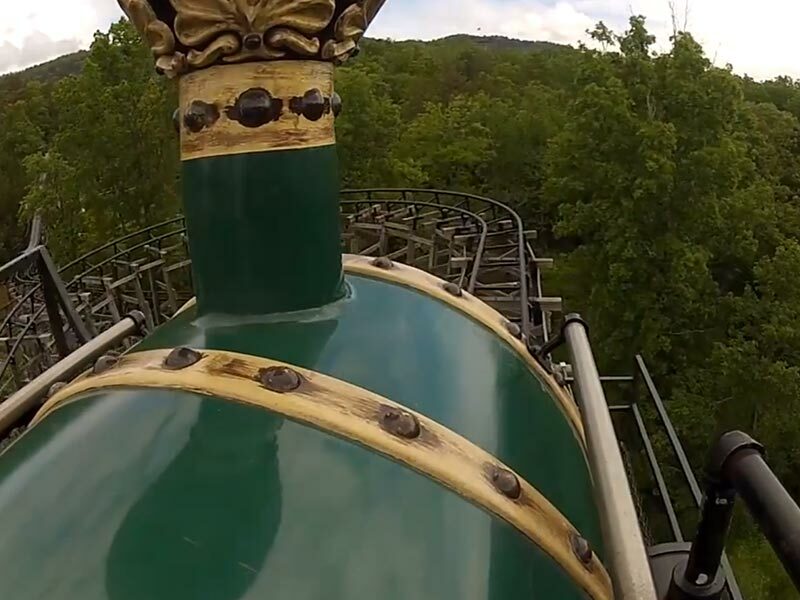 Big Bad John is a runaway mine train named after the legend of 19th century American folk hero, John Henry. 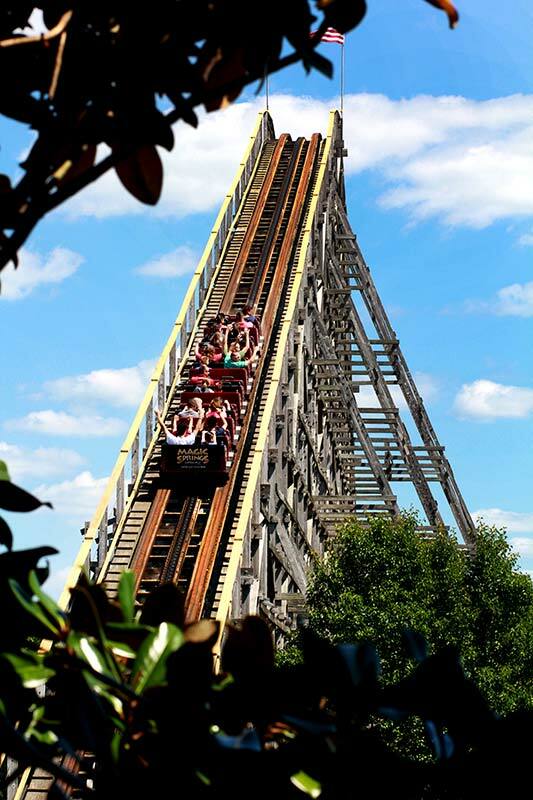 It opened at Magic Springs in the 2002 season to much fanfare including media on-hand to capture a ride taken by Governor Mike Huckabee and his wife, Janet, with park officials. Since that time, hundreds of thousands of riders have been down this track and it remains one of the most-loved attractions at the park. It is available to riders at a height of at least 42”. Load a raft with your best buds and hit the river – that is if you don’t mind a tidal wave! The best way to a quick cool-down in the Arkansas heat is wild dive down Plummet Summit. 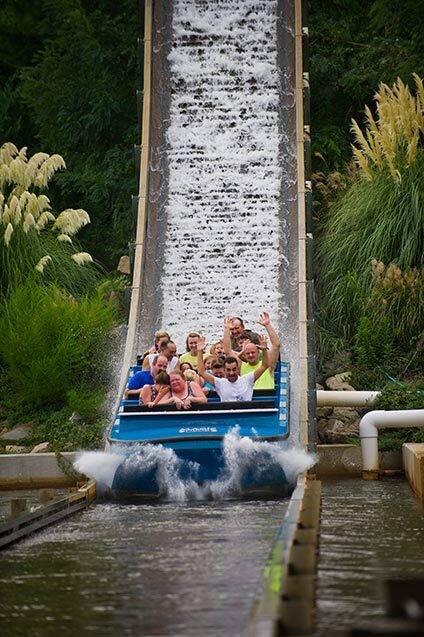 After a scenic ascent to the top of the lift hill, your boat is released into a wide trough, traversing a 180-degree curve, and finally tilting over the top of the 50-foot chute, quickly accelerating to 34 mph as you crash into 1,500 gallons of flowing water. The chills and spills from this one will hang around long after you’ve taken the plunge. On your way out, be sure to stop on the bridge for a fresh soaking from the next rafters headed down the river! 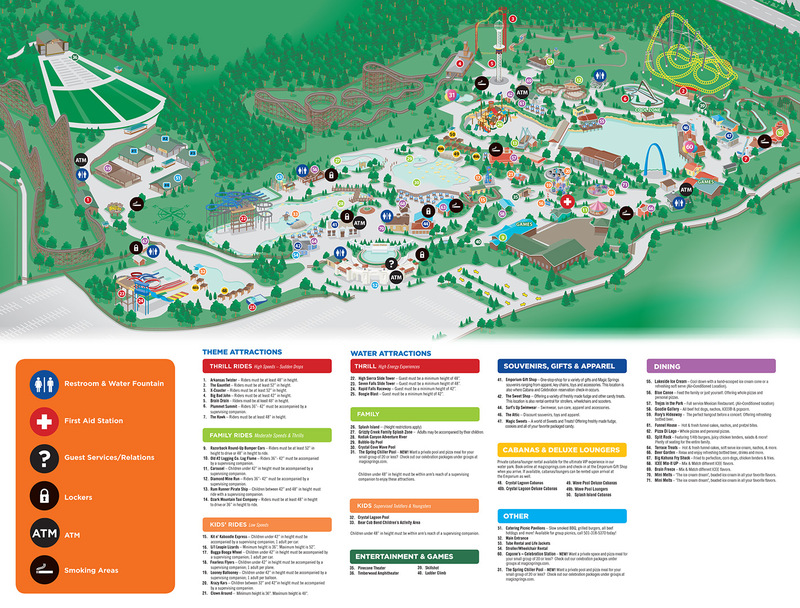 Plummet Summit came to Magic Springs in 2005 as part of a two-year, multi-million dollar expansion plan. Riders at a minimum height of 36” may enjoy this attraction. You’ll see things from a new perspective – that is, if you can keep your eyes open! Swoop, soar and dive for prey at heights up to 50 feet. 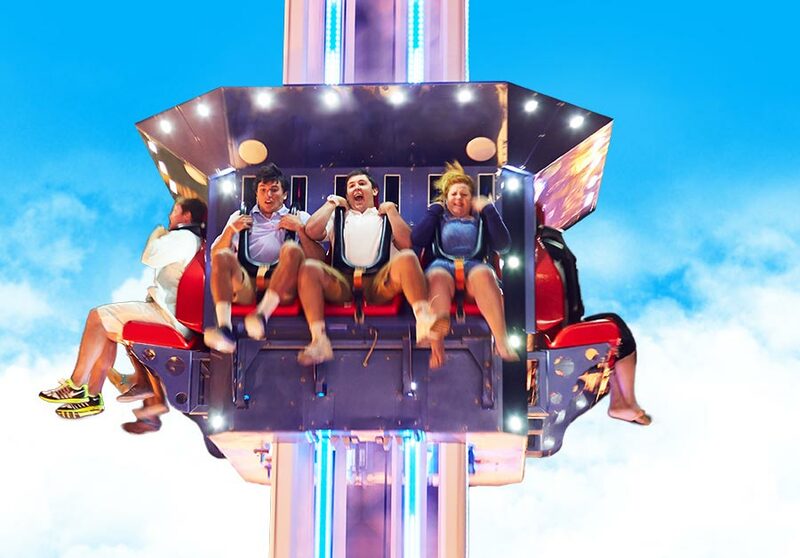 The thrills keep coming as repetitive swings hurtle downward with a boom that rotates 360-degrees both clockwise and counter-clockwise at speeds up to 13 rpm. It might even pause for a moment just as…you…turn…upside…down! Riders at least 48” in height may enjoy this attraction.